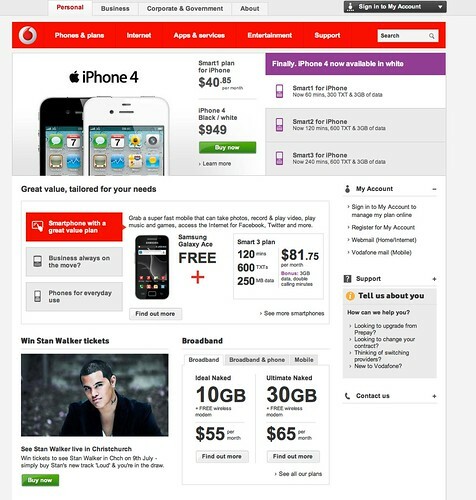 I just got the heads up that Vodafone NZ has a new website. On first glance it looks better, and I like the front and center placing of the signature product – the iPhone. I don’t understand why the iPhone does not feature in the middle phone selector section though, especially on the business page. I like the overall retail customer focusses nature of the homepage. I’m a Vodafone customer for home broadband, and I recommend them as the signup process and ongoing processes required no paper at all. The transition was fast and the service just works. I also have a Vodafone stick, and used to have a Vodafone mobile account before shifting the number across to XT. I’d like to see a more seamless experience, with the two active accoiunts automatically linked. As it is there isn’t really a need for me to login to the website that often, and the last time clearly predates my transition to 1Password which has solved everything. I am stuck in a horrible password loop with a poor message, no ‘forgot password’ action and a 30 second response time for far too long. Eventually I found a forgot-password link for home broadband users. Unfortunately the result was not a new password, but my old password emailed to me in the clear. That is completely unacceptable today, where email accounts are easily hacked and passwords are often similar across a range of sites. However it’s just as unacceptable that the password emailed to me along with the address it was emailed to didn’t actually work. So still some work to do, but pleasing to see that the company that touches perhaps the most number of customers in NZ has moved firmly in the right direction. We’ve just resolved the issue that was causing the 30-second delay on logging into My Account. It’ll be much speedier now. I concur; certainly a step up form the previous iteration. One hopes they’ve resolved the poor search functionality. Not likely you’ll be seeing this (well implemented) in the near future; the backends are entirely separate.With fixed line inheriting a nifty custom system from ihug and mobile running off a tweaked off the shelf solution.